Bill’s Produce Store and Restaurant in Covent Garden has a lovely spot overlooking the chic St Martin’s Courtyard which houses a string of shops and restaurants such as Dalla Terra. Bill’s is a darling restaurant full of charm and warmth, but on a sunny day, a table outside overlooking the courtyard is particularly pleasant. Bill’s might be a restaurant, but serves a dual function as a produce store with a range of products available for sale lining their shelves. There is something wonderfully endearing about this restaurant, and best of all, the prices are low, with most mains hovering around the ten-pound mark. We shared three starters including a hot smoked Scottish salmon (£5.65) that was beautiful, fleshy and full of flavour. 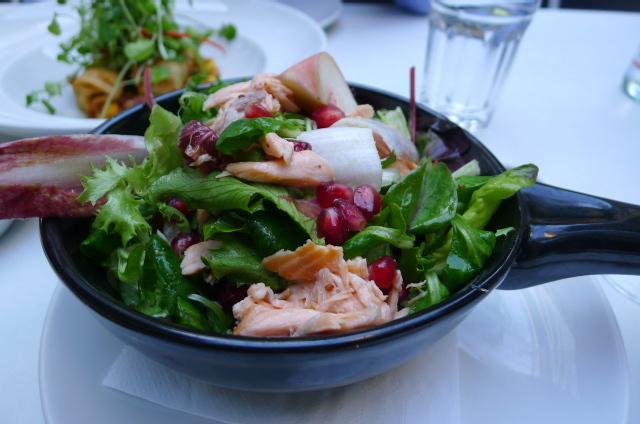 The accompanying peach salad with red chicory and pomegranate, honey and mustard dressing worked well with the fish and was a successful combination. A prawn (baby shrimp) and avocado cocktail (£5.95) was rather tasty. The tomato salsa and cocktail sauce was zingy without being too heavy. 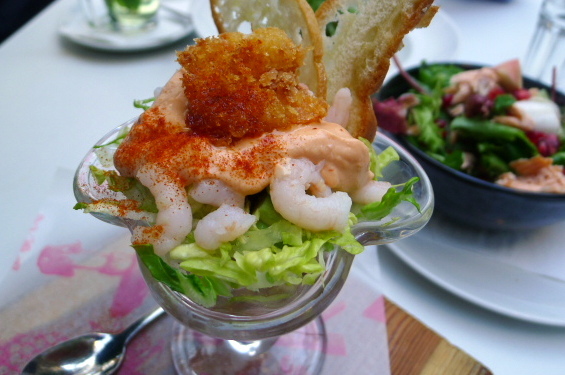 It came garnished with a deep-fried tiger prawn, ciabatta crisps and lemon. Crab spring rolls (£5.95) were fresh if a little bland. The rolls were accompanied by a fresh zingy mango, chilli and coriander salsa that on its own was really fabulous, but which was a little overpowering for the gentle flavour of the crab.
) 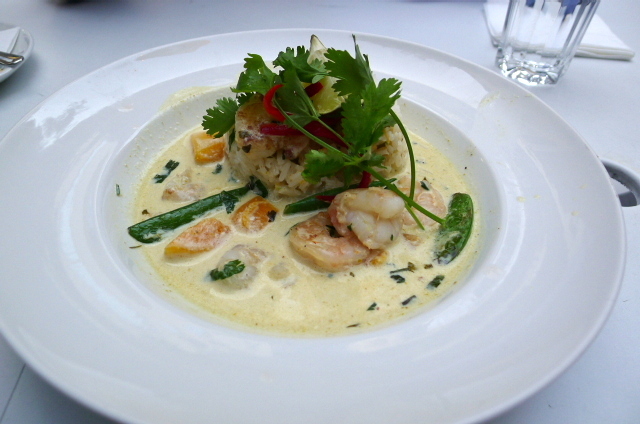 was a little stingy with barely a handful of prawns in the dish. Nevertheless the coconut-y curry with sugar snap peas and butternut squash was creamy and rewarding. 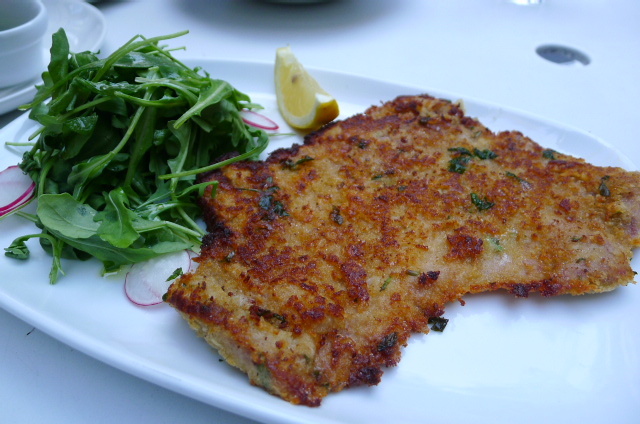 Pan-fried veal schnitzel (£13.45) was beaten within millimetres of its life. Consequently there was too much crumb to meat, and the veal was a little dry, and even though it looked big when it turned up, it wasn’t. A rocket and radish salad with balsamic dressing and lemon came as a side dish. 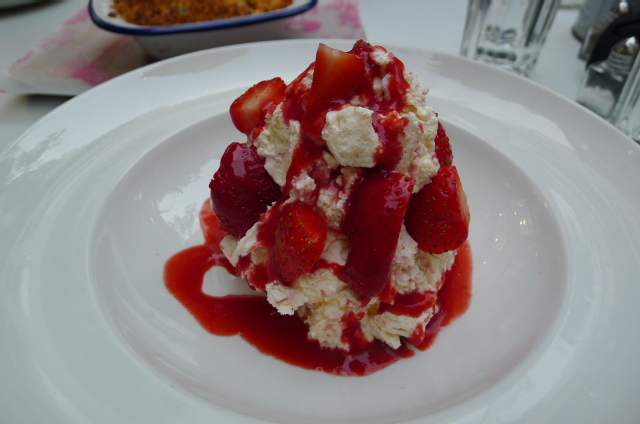 To desserts, and an Eton Mess (£5.95) was full of gooey meringue and sweet strawberries, but a touch too much cream. A big more meringue, and the balance would have worked better. A plum and blackberry crumble (£5.50) with milk ice cream had the crunchiest of toppings. 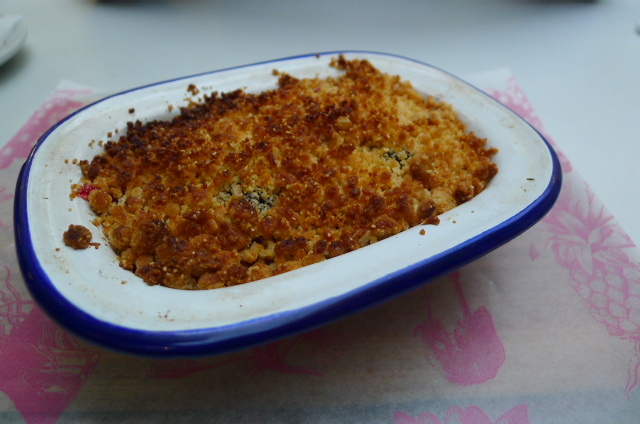 The crumble was superb, and even though the fruit was a little sour, I found this sharpness quite refreshing. Unfortunately the restaurant forgot to bring out our ice cream and needed reminding. All round, Bill’s is a lovely destination that is reasonably priced. The starters were well considered, fresh and satisfying, and the desserts were good too. I wasn’t bowled over by the veal, but there’s enough other options on the menu to choose from. The service was relaxed and accommodating. There is much to find charming about Bill’s. 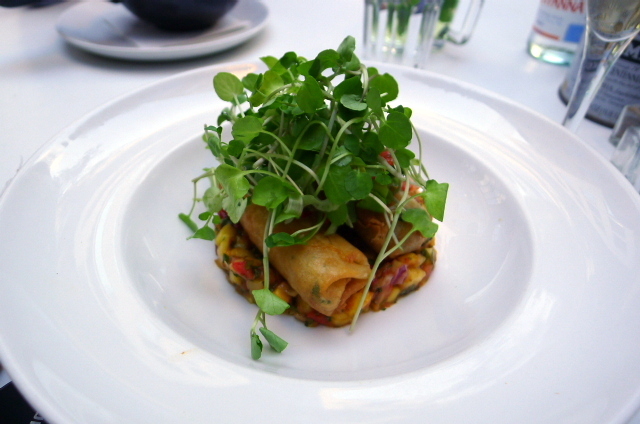 Bill’s have restaurants in various locations throughout the UK. Price range: About £18 – £25 per head. Excludes drinks and service. Restaurants are the best place to eat and hang out with friends.